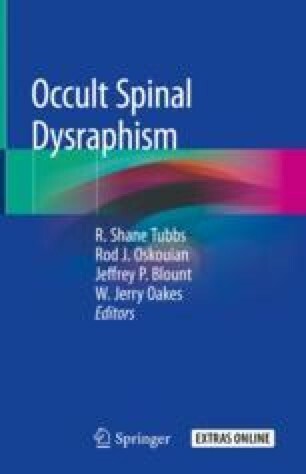 Occult spinal dysraphisms (OSDs) are congenital deteriorations that can lead to serious symptoms. OSD generally appears in children, the most common form in adults being tethered cord. Patients harboring OSD can experience a wide spectrum of clinical presentations ranging from asymptomatic to paraplegic. Although good results have been reported after surgical interventions for symptomatic OSD in adults, surgical intervention such as tethered cord releasing is a complex procedure and has serious complications. Therefore, it is suggested that surgery be planned according to dominant symptoms and by full neurological examination, craniospinal imaging, and urodynamic tests. Laminoplasty (or hemilaminectomy), short-term (less than 6 months) symptoms, patients without lipomas, and presentation with moderate or mild symptoms seem to be reliable predictors for good surgical outcomes. Urodynamic study can be used as a predictive tool for diagnosing OSD in asymptomatic adult patients and can be a guide for disease prognosis. Intraoperative neurophysiological monitoring of nerve roots is useful for distinguishing those that are functional from that are not. Thus, neurosurgeons can reduce the serious complications that can result from surgical intervention for OSD cases in adults.